You and Your Big Dreams: Thanks a bunch! If you follow my blog regularly you know I love a sketch challenge. More particularly I love Get Sketchy! They always have such great sketches. I started by cutting a piece of white cardstock to 3 x 4. 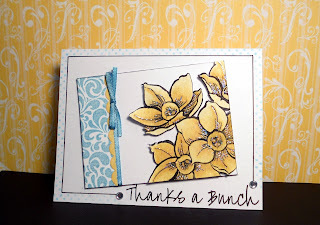 I stamped the flower (Stampendous, narcissus) on this piece and a separate piece of white card stock. I colored the separate piece with my H20 pen (Zig) and scattered straw and then cut it out. I cut another piece of white to 3 x 1 and stamped the background (Stampendous, petals nouveau) with broken china. I cut two sections of white ribbon and colored them with broken china. I punched the scallop edge (EK Success) and colored it with scattered straw. I cut it down so the scallop was a little smaller. I adhered the blue panel flat, then added my scallop and ribbon also flat. I made my bow with the Bow Easy. I adhered my flowers with foam then trimmed the edges so it was even with my panel. 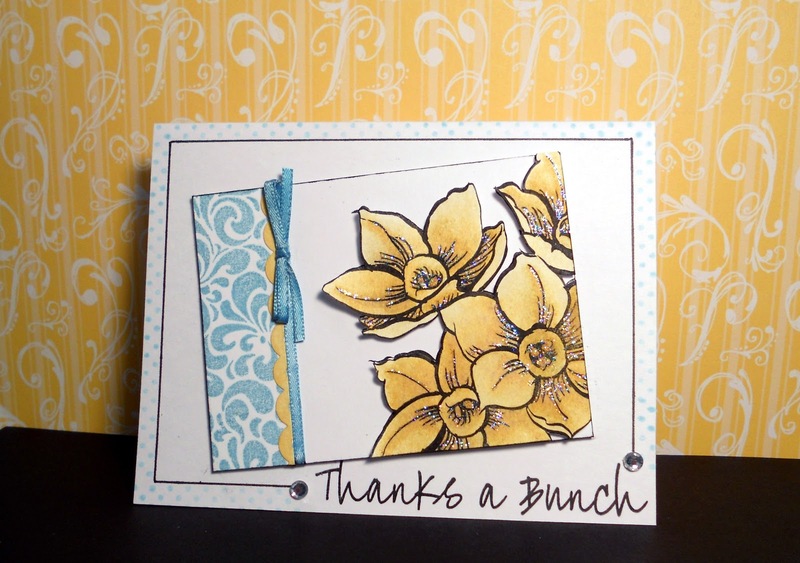 For the cardbase I stamped the sentiment (Stampendous, narcissus) in jet black archival ink (Ranger). I drew a black line around the edge 1/4" in with a gel pen and a ruler. I stamped the polka dots (Oriental Trading, fruit salad) in tumbled glass. Lastly I adhered the image panel with foam, added stardust stickles to my flowers, and two rhinestones. I gave you a Stylish Blogger Award for your site.